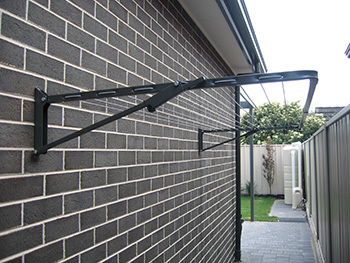 Austral manufactures the largest range of Fold Down clothes lines to suit any requirement. Austral Fold Downs have more line space than other comparative sized clotheslines. More line space allows you to hang more washing at the one time if you choose. There is no need to be tied to the laundry doing lots of small wash loads due to a lack of line space. Austral offers Fold Down Clothes Lines from 3.3m to 1.31m in length (left to right) and from 1.5m to 0.61m in depth (front to back). The Fold Down front bars may be reduced in length to fit into shorter lengths if required. All Austral Fold Downs have pre-assembled side arms to make installation a breeze. Simply remove from the box and bolt directly into pre-drilled wall or onto fixed Ground Mount Kit using fittings supplied. Austral Fold Downs* have been weight tested to hold up to 120kgs of evenly distributed washing. *Clothesline should be securely installed using appropriate wall fixings for the intended wall surface. Masonry fixings are supplied with product. Please refer to Installation Instructions.